So says Phil Stephenson, chairman of the NPA Producer Group nine years ago. 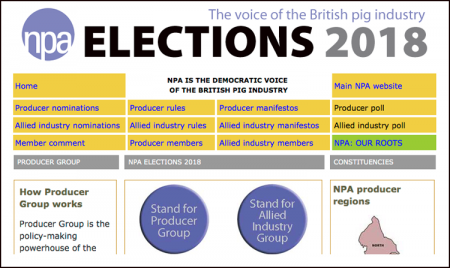 Phil has posted his unique insight into the vlaue of PG and why producers should male the effort to stand for election to join - originally published in December's Pig World - on the NPA Forum. You can view the post here. THERE IS NOW JUST OVER A MONTH TO GET YOUR NOMINATION IN - CLOSING DATE IS JANUARY 8. See the dedicated NPA election website to nominate yourself for PG or AIG. You can also see who has already submitted nominations and view the election rules. And while you're there, you can take a look at Digby's comprehensive history of the NPA - a reminder of the organisation's roots and what it stands for. What does Producer Group discuss? Antibiotic usage and targets: Where do we go from here after the announcement on progress made in cutting usage and the new long-term targets? LA-MRSA pig industry strategy: The NPA is formulating a new strategy to address LA-MRSA in pigs. What should it look like? NPA Incursion Support Network: How can the British pig industry work together to address the growing threat posed by activists? Post-Brexit support mechanisms: Millions of pounds could be available to producers under a new domestic agricultural policy. What should the pig industry be asking for? Future of Ladies in Pigs: The future of LIPs is in doubt. What is the best way forward? To nominate online for PG and AIG, go to the NPA’s new designated election website www.votenpa.co.uk You will need two supporting signatures from members - a proposer and a seconder. January 8, 2018 - nominations close. January 22 – online voting begins. March - results published on-line and in Pig World.